Cut frozen bananas into 1-inch slices. 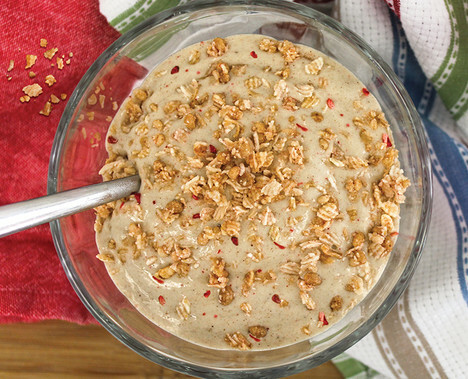 Place the banana slices in a food processor and blend until creamy, about 20-30 seconds. Should become the consistency of frozen yogurt. Add almond butter and vanilla; blend until mixed. Divide the mixture among 4 small bowls. Top with ¼ cup granola. TIP: Make healthy eating a family affair! Get your family involved by taking them shopping and prepping ingredients with you.